As a past president of the Ward One Residents Association I can say with confidence that its policy has always been to oppose making the downtown a generic event venue because it puts too great a strain on the delicate balance of residential and business uses there. On the other hand, events and institutions that reflect the special history and character of Annapolis are to be encouraged. A National Sailing Hall of Fame passes that test. Many people seem to have forgotten that the Association supported the original Whitbread Race — with a unanimous vote of a quorum of the membership at an open meeting. For years Ward One had a booth at the boat shows, which it gave up only because it became harder and harder to find residents with time to volunteer. More recently, I had not heard a single Ward One member express opposition to establishment of the Hall of Fame at City Dock. But as the details were gradually disclosed, the doubts multiplied. Because I am also a past president of the Chesapeake Bay Yacht Racing Association and a past chairman of what is now called the Annapolis Historic Preservation Commission, the then Ward One president asked me to serve on the citizens advisory committee that was formed by the Hall of Fame boosters – precisely in the hope that I could bridge some gaps which might arise. As it happened, that group met once and then was abandoned. And I found myself troubled by the sailing aspect of the proposal, more specifically the boosters’ apparent lack of interest in the relatively non-elitist historic origins of “yacht” racing. When the City’s original Hall of Fame proposal was first circulated a few years ago, it was a modest one – restore the house on the site and turn it into a museum. This seemed perfect to me. The on-site Captain Burtis House is about the same age as Eastport’s Williams House (touted as the oldest house in Eastport). It’s the last remnant of the Hell Point maritime community (most of the rest was lost to federal condemnation for the Naval Academy before the federal government became more enlightened about historic preservation). It currently houses the Maryland Natural Resources Police, a direct descendant of the State Oyster Police (better known as the “Oyster Navy”). Established by the General Assembly in 1868 to protect the Chesapeake Bay’s 356,000 acres of natural oyster bars from excess and unlicensed dredging by “oyster pirates,” at the outset the Oyster Navy had one side-wheel steamer and two sailboats to cover all that ground. 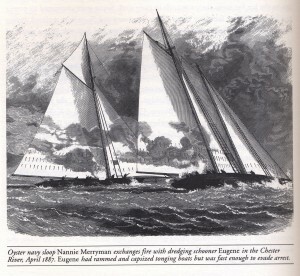 At its peak, it had two steamers, four schooners, and six sloops. The house on the proposed Hall of Fame site was home to William Burtis, who served as one of the captains in the Oyster Navy and leased his wharf to the Oyster Navy for their boats. I can’t remember where I first heard it, maybe from Gary Jobson, but it’s now a standard joke in the sailing world that the first sailboat race undoubtedly occurred the first time one boat came within sight of another. Fast sailboats on the Chesapeake Bay certainly raced for serious functional reasons – the fastest log canoe or bugeye got its catch to market first, or evaded the sloops of the Oyster Navy if need be. Just imagine match-racing with the added tactical tool of firearms. The watermen in log canoes were reputed to be the fastest sailors on the Bay, and they could sail in waters too shallow for a faster steamer to follow. The word “yacht” nowadays puts on airs, and is frequently criticized as elitist and off-putting. But its origins are as modest as the original plan for the Burtis property. According to an online etymological dictionary, it dates back at least to 1557, from “yeaghe, ‘a light, fast-sailing ship,’ probably from Norw. jaght, from M.L.G. jacht, shortened form of jachtschip ‘fast pirate ship,’ lit. ‘ship for chasing,’ from jacht ‘chase,’ from jagen ‘to chase, hunt,’ from O.H.G. jagon * * *.” That’s the true origin of sailboat racing — watermen, pirates, and maritime law enforcement — and the Captain Burtis House and its history make a perfect introduction to a Sailing Hall of Fame. As Gary Jobson puts it in a promotional video, a laudable purpose of the Hall of Fame will be “educational,” to celebrate “unsung heroes and heritage” and “inspire youth involvement” and “outreach” to “new sectors of society.” However, I believe that the plan to eliminate the Captain Burtis House reflected a bit of putting on airs as well. If we really want to celebrate sailing’s unsung heroes and heritage, leaving the Captain Burtis House out of the story would have been a big step in the wrong direction.